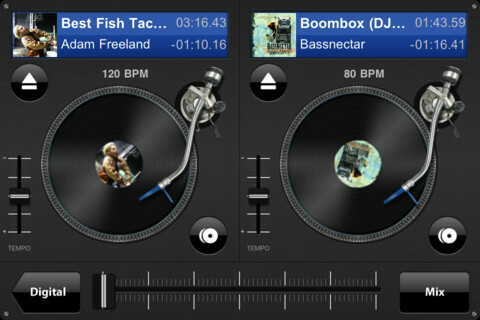 DJ Mixer Pro turns your iPad, iPhone or iPod Touch into a Turntable and full featured DJ system. DJ Mixer Pro has all the standard features of DJ systems, including Simple and Advanced EQ, high and low pass resonant filters, mixing capabilities and turntable functions. Additionally it comes with free 12 tracks featuring dancefloor hit Vegas by Vandalism & Static Revenger, and tracks from Bassnectar, DJ Rap, The Crystal Method, Photek, Darren Emerson, Adam Freeland, D. Ramirez, Veze Skante and Evil Nine. This app gives you the option to manually DJ your tracks or to let it do the DJ tasks automatically for you while you chill or dance to your music. Additional functionality is available as an in app purchase. This includes the ability to mix your own music without limitation, headphones mixing, WiFi party and Premium Effects pack. New free song from Fiz! New for iOS 6.1 - Mix tracks when using iTunes Match. New: Headphones monitoring on/off switch! New: mix button in iPad mixer screen! New: Upload your recorded mixes to dropbox! Added back the previous track button in the iPad mixer screen. Improved transport control buttons. Full Mixer Upgrade. Unlock your entire music library. DJ with Headphones with 2 mobile devices over Bluetooth - no Wifi Required! Show currently playing track in the iOS 4+ background task bar and support pause and play from the task bar. Show cover art of playing song on device locked screen.